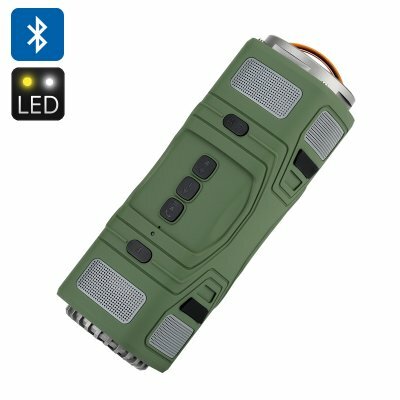 Successfully Added Rugged Outdoor Bluetooth Speaker "Thunder" - 10W, 2200mAh Battery, Flashlight, Waterproof IPX5, Dustproof IP4, SD Card to your Shopping Cart. If you're looking for an affordable outdoor speaker that packs some punch in the base department and isn't afraid of the wet then the OP Thunder is for you. With its masculine design and hanging buckle the OP Thunder has a tough outer and IP45 waterproof and dustproof rating so its able to handle the outdoors well while still delivering incredible sound. Twin 5W speakers bring a thundering performance so you can really crank up the sound without suffering from distortion and with its modest 300gram weight its light enough to join you on a hike or camping trip, without weighing you down. A built in 2200mAh batter brings the speaker around 6 to 8 hours of play time and will can also be sued to power the built in LED flashlight letting you get around at night and making for a great party companion. Bluetooth connectivity allows you to stream music to this rugged outdoor speaker direct from your Smartphone or tablet and with hands free capabilities you can even pick up calls direct from the speaker itself, great for when your hands are needed elsewhere. For non Bluetooth enabled devices there is an audio input jack and with 32GB micro SD cards supported this speaker can store a whole library of tunes for those all night parties. If you're looking to party outside and enjoy the sunshine this summer then you need a speaker capable of keeping pace with you. The thunder does just that and will bring great audio with spectacular clarity so you can get your groove on in the sun. This rugged outdoor Bluetooth speaker comes with a 12 months warranty, brought to you by the leader in electronic devices as well as wholesale Bluetooth speakers..